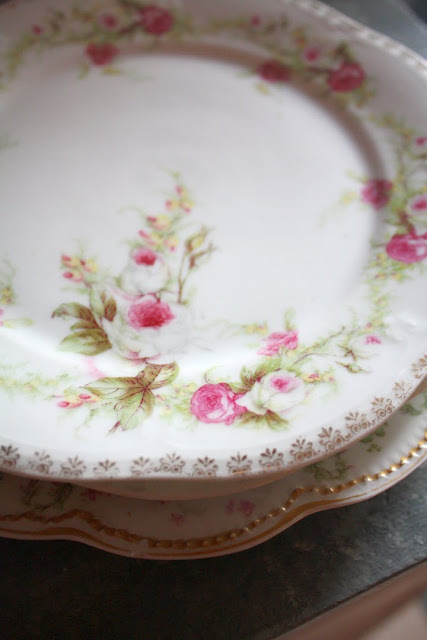 This week for Show and Tell I'm sharing some dishes I found at the flea market last weekend for $2 each. I bought 2 of this pattern below. They were made in Bavaria. I love the roses on these, they remind me of my absolute favorite rose "Pierre de Ronsard", also known as "Eden." 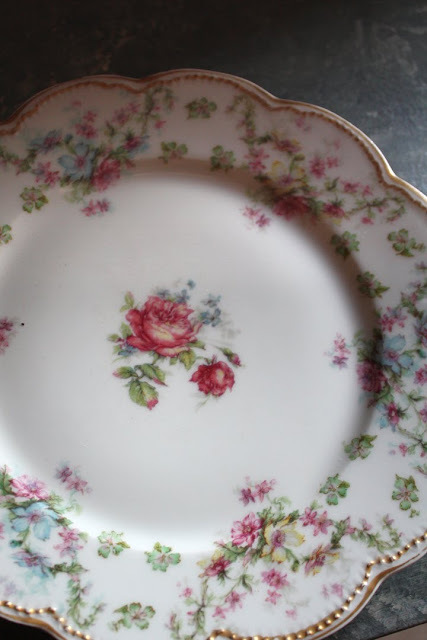 From the same vendor and also $2 I found this Limoges Haviland & Co. plate below. It has a few little chips around the edge but for $2 I couldn't pass it up! I just love old dishes! I have to say one of the best things about blogging is finding out that so many of you feel the same way! For all of you who are in the San Francisco Bay Area, Vintage & Vogue (downtown Campbell) is having a Holiday Celebration Friday, November 13th 10:00 am-9:00 pm and a 15% discount will be offered all day! I drove by the other night and all their Christmas decor in the window looked so beautiful! If you are joining in on Show and Tell Friday, please remember that your Show and Tell needs to be something from your home or garden. Please read the Show and Tell Guidelines for step-by-step instructions on how to participate.If you would like to join in, please enter your name and leave your exact Show and Tell blog post link, not just your blog link and as a common courtesy link back to my blog. If your link has been removed from MckLinky, please re-read over the guidelines before re-posting, or e-mail me with any questions. Very soft and sweet plates, Cindy....they seem very much your style. Wow, what a great find at two dollars each! Have fun at Vintage and Vogue. I am going to an antiques fair this weekend. Hopefully the predicted rainstorm won't prevent us from attending. Cindy, what WONDERFUL finds! I can't believe the price of those pretty plates! You lucky girl! I love vintage plates also! The one in the bottom picture looks like it might even have a little bit of your favorite blue in it! Very pretty! Cindy, thank you again for hosting this party. It's always one of my favorites. I try to get here early so that I can get a headstart on looking at everything. Your blog is looking as lovely as ever, and I truly enjoy my visits here. I do so love pretty plates even if they do have a chip or 2! I am always saying that if someone where to break into our home they might think they hit the jackpot till they go to sell all those pretty , look like a million, but definitely chippy and imperfect dishes!! 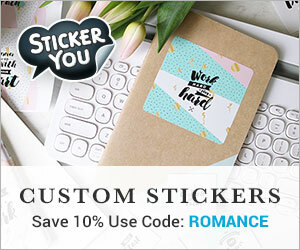 Very, very romantic...and at that price a "steal"....you lucky thing!! I share your love for beautiful old plates...and these that you found for just $2 are gorgeous! Great treasure find, my friend! Enjoy!!! Just want to thank you again for hosting Show & Tell Friday! Check out the roses on this blog. You'll absolutely swoon. Very elegant and classic! I like roses, me too. From one dish-a-holic to another...it would have been IMPOSSIBLE to just walk past those pretty dishes! They ae just lovely! very pretty dishes. I see many marican bloggers loves theese rosy dishes. Fun to see differenses in the shabby chic style, because here its not so. But i have no problem seeing them beautiful. 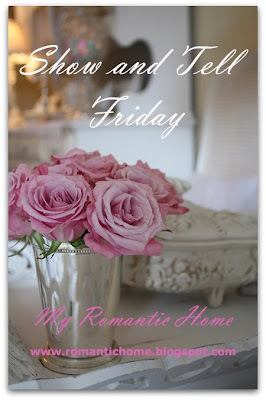 Hi Cindy, i love your Show and Tell Friday, i tried to join, but as i'm new to blogging, i guess i did soemthing wrong. Will have to get someone to help me. Maybe next time. I love the plates. Have a great weekend. Hugs from another Cindy in Oz. Your style and wonderful eye for beautiful things is such an inspiration!! I love to be here! Thanks for hosting - and I'm lovin' the plates. These plates are simply beautiful! What a bargain price, too! Thanks so much for sharing and hosting. Now that's what I call a bargain! Beautiful plates that would probably be $20 a piece in a shop. I love old plates and china, too! Those are especially pretty pieces, Cindy. I would have snapped them up, too! Absolutely beautiful dishes Cindy!!! and just for $2 each, my goodness, I need to go over USA for treasure hunting. Pierre de Ronsard roses are my favorites too and have many, all in buds and waiting to bloom fully... yesterday I cut some few of them... come and see what I did. Such pretty plates. Makes you wonder about the history of them and who originally bought the plates because they liked them too. You founds some real beauties. I love old plates, too. I like to use mine to serve desserts. sooo pretty! Makes me want tea and cupcakes! Of course you know I absolutely love your show and tell plates! Would love to go thrifting with you some time. These would fit right in with the pink and brown tablescape I made for you. Beautiful dishes ~ you can never have too many, especially at these prices. Hope your weekend is wonderful! This is my first time joining with you. I really enjoy your blog! So many great ideas! The plates are a great find. I really like them. Thank you for sharing. Gosh Cindy those are beautiful. Oh, so pretty!! I wish we had a Vintage and Vogue here. What a deal! Love your beautiful plates and such a good buy! I linked up today and I am showcasing one of my dish sets too. Gorgeous plates! I spent many summer vacations in Bavaria with my grandmother as a child. If I'd known then that I'd have such a passion for dainty rose plates, I would have asked her for all of her floral dishes. Beautiful plates and a great price. I'm beginning to think you and Kelly are twins separated at birth, you both are on the same wavelength. Very pretty plates and such a fun find! WOW girl, $2!!! I think you're the one to shop with! Well maybe not...we like all the same things. These are really lovely. Such pretty china! I love to mix and match pretty rose china on a table, makes for great converstation. Thanks for sharing! So Beautiful and love your closeup pics. I get these mix and match lovelies at our GW and leave the small plates and tiny bowls stacked on my counter so I can see everyday and pull one out to put under my morning coffee. Let's which one will I use today. I love your plates! They are beautiful! Pink Blessings! Your dishes are fabulous, Cindy! Soo romantic! Sorry for not having joined you yet, but I just cannot bear the pressure! Life's too hectic for me at the moment! 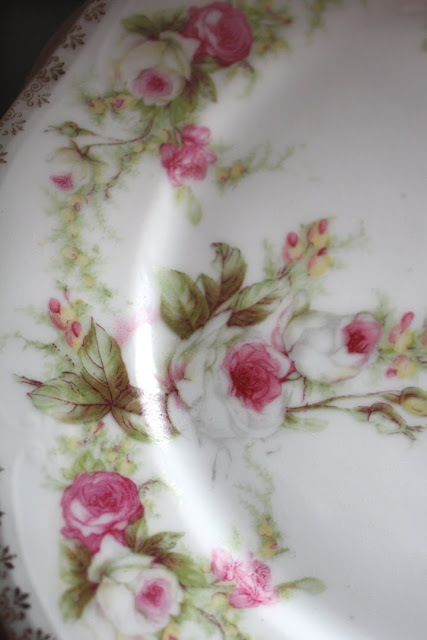 Hi Cindy beautiful roses and find..people think I am nuts ooooing and ahhhing or chippy shabby finds in thrift shops..
That plate is gorgeous and it would go so perfectly with little Miss G4s room-it is shabby chic pink. Great buy on the plates they are beautiful! This summer I bought a pretty pink rose dinner plate and decided right then to begin collecting dinner plates with pink roses on them. So far I have just the 1. My plans are to collect at least 12 so that I can set a table with all the different plates and let each person at the dinner choose the setting with their favorite plate. Hows that for choosing placement for a dinnerparty? If you ever want to sell please keep me in mind.